have I felt the sensation of real death, death without hope..." - Federico Garcia Lorca, October 1929. What's the worst that's likely to happen to our investment portfolios? Honestly, no one can say. But armed with knowledge of the worst U.S. portfolio disasters that have happened over the past century, we are perhaps better prepared for the financial shocks of the future. This post briefly compares the performance of different stock/bond mixes during the Great Depression of the 1930s, the oil price and inflation shocks of the 1970s, and the Tech Crash & Financial Crisis of the 2000s. Technical note: In the three charts below, each portfolio's performance is indexed to the pre-crisis market peak. All returns are geometric total returns, inflation-adjusted, with dividends reinvested. Each chart is drawn to the same scale, with black circles showing the point at which each portfolio permanently regained its real pre-crisis value. 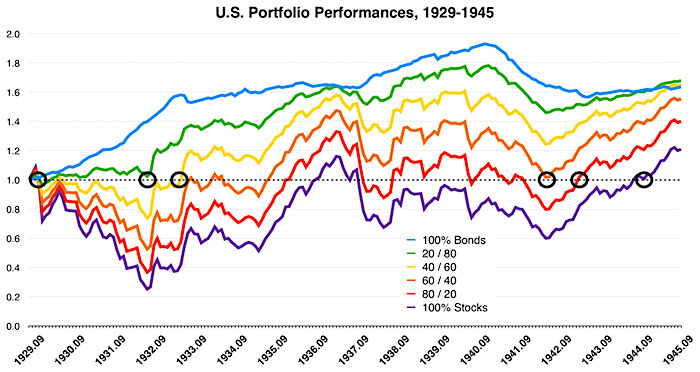 The Depression Era performance of stocks and bonds is widely known. Stock-heavy portfolios dropped up to 75% over 3 years and took 12-15 years to finally regain their real value (chart below). 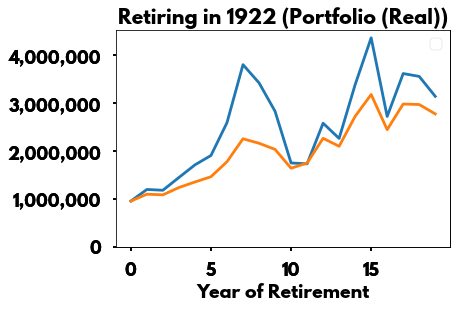 Due to strong deflation, especially in 1931-33, bond-heavy portfolios regained their real value within just 4 years, with modest positive returns over the period. Note: The 100% stock portfolio did briefly dip below its 1929 high several times during 1948-49. The real price of imported oil in the U.S. increased 6-fold in the 1970s, leading to runaway inflation and stagnant economic growth. Initially, stock-heavy portfolios were hit the hardest, declining up to 50% within 18 months (chart below). Later, as inflation accelerated, bond-heavy portfolios suffered as well, declining up to 40% by 1981. Once inflation subsided, the various stock/bond mixes all regained their previous real values more or less together after 12 years. As you perhaps know well, the 2000s saw both the collapse of the dot.com bubble and an international banking crisis. Stock-heavy portfolios declined up to 40%-50% in both events and did not permanently recover their real pre-crisis values for 10-13 years (chart below). Due to declining interest rates and flight-to-quality, bond-heavy portfolios barely suffered during the period, but with modest returns. PS. Many thanks to Forum member siamond for instruction on the use of geometric rather than arithmetic total returns. Last edited by SimpleGift on Sun Jul 08, 2018 6:56 am, edited 1 time in total. Looks to me like a 50/50 split would have many advantages---perhaps it is the best way to ensure that one gets an average of the average returns? Interesting charts as usual...Thank You. as much as they could through the whole thing. considering they were using a 60/40 balanced fund. A poll that Mebane Faber did not long ago asked investors what the maximum drawdown of bonds in real terms for U.S. investors over the last 100 years was. Nearly all of them dramatically underestimated it. You've correctly pointed out that it was approximately 40% over a five year period. Those 'safe' bonds may not be so safe after all. The 1970s seem to make a compelling case that inflation-linked bonds should comprise a substantial part of one's fixed income holdings. Of course, one counter-argument to that is that if bonds are meant to smooth out portfolio volatility and offer stability, inflation-linked bonds are less than ideal as they are quite volatile compared to other bonds. Logically, I can see a strong case being made for splitting one's fixed income between TIPS and short-term Treasuries. The former provides protection from unexpected inflation, while the latter provides stability and liquidity. 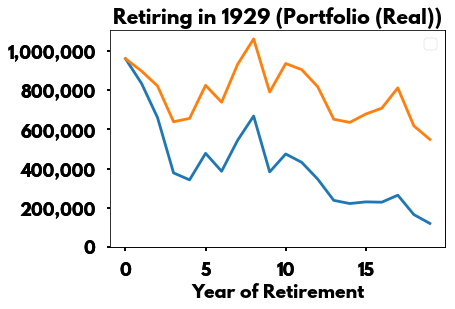 One motivation for the OP analysis was to shine more light specifically on the portfolio disaster of the 1970s. The Great Depression is already well-known and many investors personally lived through the Tech Crash and Financial Crisis of the 2000s. Do I think that central banks around the world are likely to ever let inflation get that out-of-control again? 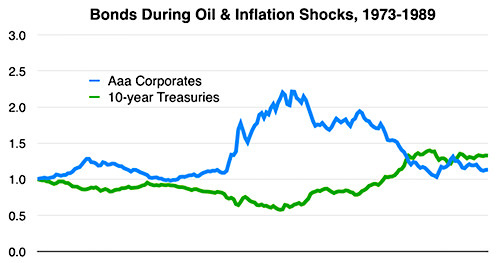 No, but the 1970s showed the devastation that high inflation can wreak upon both stock-heavy and bond-heavy portfolios. Your suggestion of a TIPS allocation seems like a rather low-cost but valuable insurance policy. Simplegift, great work as usual. Hopefully, someone can help me out as one poster sometime ago posted a presentation by DFA using Dimson Marsh data for 101 years as to stretch this discussion FURTHER out over multiple countries and periods of history. I remember an interesting observation as one of the slides showed the top 5-6 largest single country equity downtruns throughout HISTORY and the results were quite interesting. I remember cash and bonds took longer to recover in those situations then a high equity allocation. So the teaching point may not be so obvious in "worst case scenarios". Now hope someone can find the slide I am talking about. What I take out of the excellent chart is what I have said for sometime... If one is going to be HIGH in equities one better: Have a rock solid occupation, long time horizon, no need for liquidity of that money, and ability to stay the course. Shakespeare is correct "Time heals all wounds". The question then becomes does the investor have the time to recover if one of these droughts occur. It seems like a good argument for a 50/50 portfolio over the long run. But, i fear that looking at the data starting just before the meltdown periods may lead to the wrong conclusions. Not sure about the oil/stagflation shock of the 70s, but both the great depression and the tech bubble were proceeded by huge run up in equities. The plots show each of the asset allocation cases starting at the same point. But, if one had been investing prior to that arbitrary starting point with the same allocation, the starting value would have been vastly different. So, even though a more stock heavy portfolio may have lost more during the down turn, it would have started at a much higher beginning value. I have not done the analysis to see if in the end that would have changed the story much, but i would just caution drawing too much from looking at just the period of draw down. We have to live with both draw downs and melt ups. What impact does the choice of "stocks" and "bonds" make in the discussion? It looks like the "stocks" is S&P500 and bonds is 10 year treasury bonds? 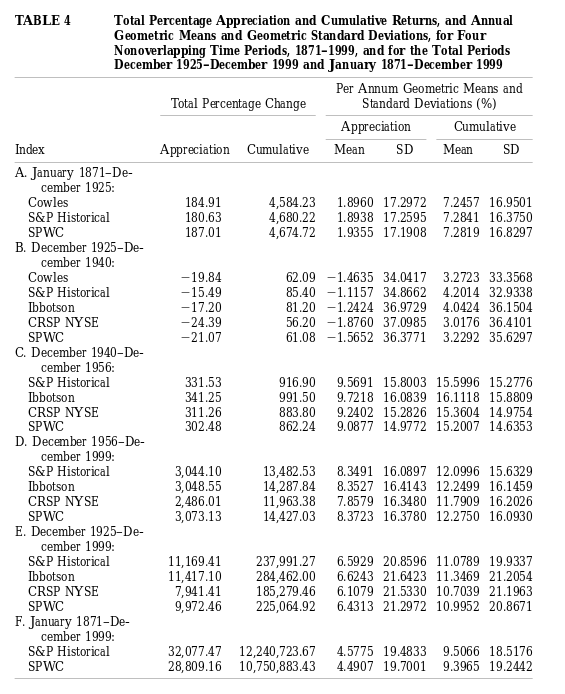 S&P500 was not really the S&P500 and only included, what, 90 stocks in the early days until 1957. Would a total stock market fund make any difference? And how does the 10 year treasury bond return compare to something that most people may invest in (total bond market fund or intermediate bond fund)? What I take out of the excellent chart is what I have said for sometime... If one is going to be HIGH in equities one better: Have a rock solid occupation, long time horizon, no need for liquidity of that money, and ability to stay the course. Thus the standard Boglehead recommendations for adequate bond allocations and emergency funds are not just empty bromides, but are based on real-life experiences of past portfolio disasters. Last edited by SimpleGift on Fri Jul 06, 2018 6:52 pm, edited 1 time in total. I don't believe that there is much debate about the viability of the stock data used in the period referenced in the OP. Ten year Treasuries are more volatile than total bond market or intermediate term Treasuries, but likely still a decent proxy. The fact that this happened has happened to millions of people in the U.S. and not just in one or two limited time periods leads me to believe that intentionally using your home as an instrument to gain investment leverage is riskier than many believe. Historically, the odds are high that it will work out fine, but that tail risk may be gnarly. Using a total stock market fund for the Great Depression would make things look worse -- small cap stocks got obliterated in the Great Depression -- though I'm not sure the difference is big enough to change any conclusions or cause people to change their investing strategies. You see that over the 1924-1940 period there are 4 different historical data series and the total percentage return varies from -15.49% to -24.39%. "S&P Historical" is the 90-stock index you're talking about, so you can see that it has the "best" return (only -15.49%) whereas all the others had worse returns. A 10% difference sounds huge but that's over 16 years. It is really just a 0.7% difference each year that adds up; and I'd argue that's not the kind of difference people really notice in the real world. Yup, exactly. Those charts are essentially cherry-picking, I am afraid. Not only do they start in the year where two of the worst stock crises started (1929, 1973, 2000), but they even start at the very exact right month to make a stock-heavy portfolio look as bad as possible, totally ignoring the big ramp-up that preceded the crisis. This isn't terribly meaningful. We could assemble charts like that, with a different starting point, where a bonds-heavy portfolio would look incredibly bad. Notably somewhere in 1941 where bonds started on a drop deeper than 40% (in real terms) which lasted more than 40 years before recovery. 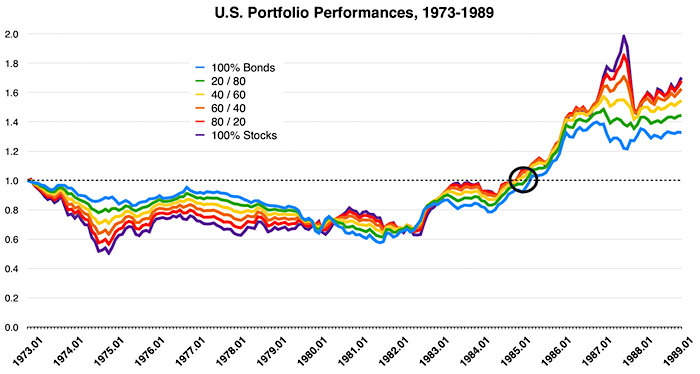 Which in my humble opinion is by far the worst US portfolio disaster. And this would be equally meaningless, a single data point in history which has no chance of happening again in the same manner. In the Simba backtesting spreadsheet, one can quickly assemble portfolio cycles charts, varying the starting year, and comparing two portfolios according to a given metric. Here is an example, showing the CAGR (in real terms) of two realistic portfolios over a cycle of the 30 years, varying the starting year. Then we can truly appreciate the diversity of outcomes. Yes, no monthly returns in there, so the Sep 1929 'worst case' is missing, but how meaningful is that? Then, much more significantly in my opinion, one can easily look at a drawdown analysis and an SWR analysis. I went on a long rant on this precise topic in this recent blog... Here is the SWR chart, which illustrates much better how bad the various crises were, by accounting for sequence of returns issues and regular withdrawals (e.g. for retirees). My overall feedback to the OP is that, by overly focusing on a few cherry-picked starting points, one can end up with very flawed conclusions about their own strategy for the future. Those charts are essentially cherry-picking, I am afraid. Not only do they start in the year where two of the worst stock crises started (1929, 1973, 2000), but they even start at the very exact right month to make a stock-heavy portfolio look as bad as possible, totally ignoring the big ramp-up that preceded the crisis. Well, the whole point of the OP and this thread is to discuss what the very worst portfolio losses (magnitude and duration) during crisis periods have been over the last century. Thus they have to start at the peak month of the stock market in the years of the crashes — in 1929, 1973 and 2000. It's a feature, not a bug! 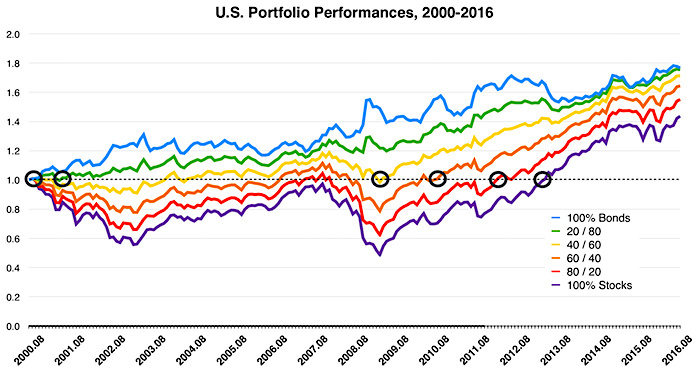 Appreciate your analysis of historical 30-year portfolio CAGRs over various starting periods — but that's really not the point of this thread, which focuses on worst case, portfolio crisis scenarios in history. To elaborate on marcopolo's point, here's a series of charts showing the years before 1929. Let's start with the usual 1929 chart, showing 100% stocks (the blue line) and a 60/40 portfolio (the orange line). This is inflation-adjusted portfolio values assuming 4% inflation-adjusted withdrawals. That's the kind of chart many of us have seen many times. But let's wind back the clock a little bit. 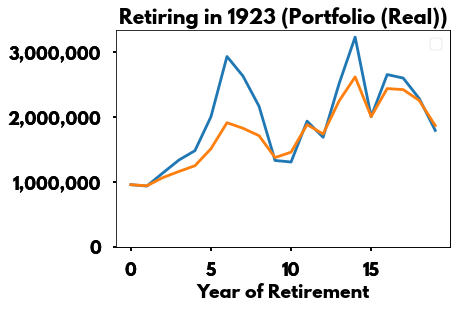 What if someone didn't retire in 1929. What if they retired in 1922, just a few years earlier? Now let's look at a few more years. From 1925 and earlier, the 100% equity portfolio does at least as well, and usually much better, than the 60/40 portfolio despite suffering the worst equity crash in US history. So this is something that I personally struggle with. When I look at charts of the massive runup in the US & Japan before their huge equity crashes, part of me wonders whether any retiree would really have retired anywhere close to the peak at exactly Their Number. On the one hand, I know how easy it is for humans to get swept up in hysteria and manias. On the other hand...(at least on this board) it seems that everyone suffers from One More Year syndrome and pads Their Number out quite a bit. And from what I can tell, at least in the US, as long you retired +/- 24 months away from the absolute worst month you are basically okay no matter what your asset allocation. You can also use shorter term bonds to mitigate the effects of inflation. Most charts like the ones above use 10-year Treasury bonds. If one is using Total Bond Market (6.1 years average duration), one should do better. Or one can use even shorter term bonds or CDs. Yep. Reducing the duration has helped to deal with short-term inflation risks. I believe that even the lowly T-bill has only lagged the current CPI by more than 1% only once or twice in history for more than a few months. Beside 10-year Treasuries, the only other monthly bond series going back to the early 1900s that I'm aware of is the Moody's Seasoned Aaa Corporate Bond data (found here). These are high-quality corporate bonds with maturities 20 years and above. To see how they performed compared with 10-year Treasuries during our three portfolio crises, the charts below show their real monthly total returns indexed over each period. 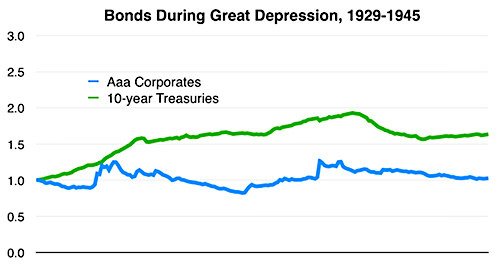 During the Great Depression, 10-year Treasuries outperformed by a wide margin, but corporates mostly held their value. During the Oil and Inflation Shocks, corporates massively outperformed, while 10-year Treasuries lost 40% of their value. 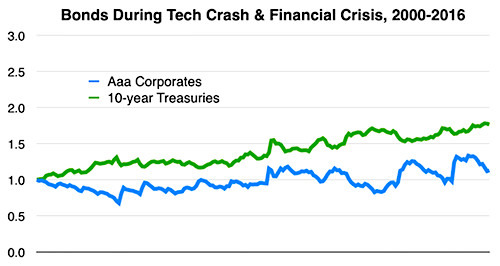 During the Tech Crash & Financial Crisis, 10-year Treasuries outperformed and high-quality corporates did just OK.
Bottom line: A mix of Treasuries and high-quality corporates like Total Bond or Intermediate Bond Index Fund would likely have performed fine during the three crisis periods — but TIPS replacing nominal Treasuries would have been better in 1973. - more people have piled into the market, making it richly valued. That includes new investors, existing investors deciding to go 100% stock, people deciding to quit their jobs and trade stocks for a living (saw a lot of this in the run-up to 2000, like we saw professional house-flippers in 2007), etc. All that increases the value of their portfolio and brings more people to their number. - The number of people who could retire because they believed their portfolio could sustain them dropped with the stock market crash. Benjamin Roth's "The Great Depression: A Diary" (recommended a few times on this forum) really brought to life how it wasn't that nobody knew when the stock market would recover; they didn't know if the stock market would recover. It's easy for us to look at how the market did for 20 years but all anyone saw after the crash was the blue line dropping like a rock. Stock market increases have surprisingly little impact on causing people to retire. Not "no impact". But more of a marginal impact and a pretty small one. After all, most people tend to be constrained by things like "I need Social Security to make up 20-50% of my retirement income, so I can't retire before 62 unless my portfolio gets MASSIVELY larger" or "I'm not going to retire, no matter what, until the kids are out of the house/graduated from college" or "I'm not going to retire until after the mortgage is paid off" or "I'm not going to retire until my pension is fully vested" or "I'm not going to retire until I get promoted to G-14 and have the higher pension payout" or "no point retiring, since my spouse isn't going to retire for 2 more years" and so on. 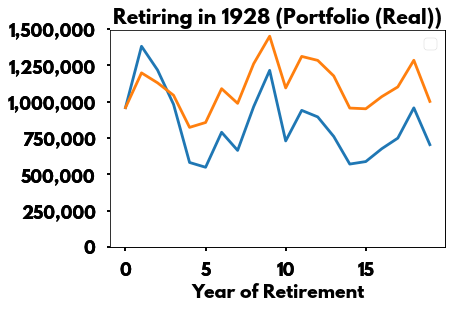 At its peak in 1999, the percent retired in the sample is about 3.3 percentage points higher than it would be without the extra stock returns. In context this means at age 62 the percent of those retired went from ~49% to ~52%, or about a 5-7% relative increase. The effect on the average retirement age can be found by adding the effects at the various ages. When this is done, the conclusion is that the average retirement age for the entire sample is decreased by 0.25 years, or about three months. Though we have to keep in mind, as always, that averages can be deceiving. The average person has <$100,000 so of course a massive bull market isn't going to allow them to retire 5 years early or anything. Overall, while the narrative of more retirements at the top of a bubble sounds plausible on the surface, I've never found anything like actual data to support the view that it is anything but a small, marginal effect outweighed by many other personal circumstances. Thanks again, Simplegift, for a good depiction of what the worst can look like. I'm an early on boomer, so I grew up with a set of great grandparents, grandparents, and parents who had experienced the G. Depression. Tales of stock losses, home losses, job losses, bankruptcies, suicides, and begging were a part of many a discussion so the younger ones would know what could happen. One set of my great grandparents never trusted banks again and ran their own little loan operation out of their farmhouse. None of them trusted stocks, except the younger ones too late in life to really benefit. I bought my first investments in 1970 and know what torture it was to stay invested. I remember one fund I bought in '70 that I sold in '83 for a loss, two years into the recovery. It's hard for anyone not living through inflation/poor stock returns/poor bond returns to really understand how misery compounds. Folks who lived through the lines at gas stations and all the inflation didn't get as traumatized as those who lived through the depression, however. "Timing newsletters" proliferated in the eighties to tell people when the next crash was coming. I sat in front of a quote machine in Oct. 19, '87 and saw price declines that were simply beyond belief. Stocks gaping down high percentages on the next trade. Lots of dire headlines were written by folks my age who had heard their grandparent's tales of woe. Happily, '87 ended as an up year. I have since watched my generation gain great confidence in our financial system. Most have not been traumatized by market crashes in 2000 and 2008-9 like my ancestors were. In fact, most people I deal with, even if they think the market is overvalued, would be delighted to get back in with a good correction, or so they think. I'm with those who say we retired ones probably are best off with a 50/50 or something close allocation to broad stock indices and low to intermediate duration bonds, a good portion of those inflation protected. Not because we think we know what is going to happen, but for the reason Peter Bernstein said he preferred 60/40: we don't know. The "worst" you show very likely won't happen again--there are good reasons for higher confidence in our financial systems--but nothing guarantees that something cannot sail out of the mist and wreck havoc on the best portfolios. In fact Paul Merriman uses a mixture of intermediate-term, short-term, and inflation-protected Treasury bonds in his recommended portfolios. I always wondered why he was completely eschewing corporate bonds, I suppose he also prefers taking all risk on the equity side. I think the takeaway still is that you didn’t base the analysis on a “worst case” for *portfolios* but rather a worst case for *stocks* because the dates were primarily based on stock crises. The same analysis starting in late 1940 would be an interesting one. Bonds won’t look so “safe” when you include peak start dates for bond crises and not just stock crises. Thanks for doing the analysis by the way, good stuff! Point taken. My focus in this thread was primarily on "stock crises," since they tend to be the most emotionally dramatic and frightening for beginning and veteran investors alike ("death without hope..."). Perhaps it would be worthwhile to do a follow-up thread one of these days that focuses on various portfolio performances during "bond crises" (though we may have to come up with a less oxymoronic name!). Thank you for the suggestion. this was really useful thanks! It's a really first-class look at the 1990s crisis using excellent stock and bond data for the Japanese markets. Last edited by SimpleGift on Sat Jul 07, 2018 9:09 am, edited 1 time in total. Sure, I was keenly aware of the fact that this thread, by design, focuses on worst US stock crises (which is actually NOT the same thing as the worst portfolio disasters). And this is my entire point. I am afraid this kind of perspective is terribly misleading. I don't know, it seems that some people somehow like to frighten themselves with this type of cherry-picking of 'worst cases'. Trouble is those are a couple of extreme singularities. What real lesson can you learn from those? It isn't difficult to find worst singularities (e.g. from international stock history AND from bonds history). So should we look for those? But then the stock market closed for decades in some countries, which is even worse. Where do you draw the lines, notably in your expectations about the future? This makes a great argument for why 100% stocks has never made sense for me at least - although in 1973 there was really no good place to hide in the U.S.
OP, you missed to include those portfolio disaster years when stocks heavily outperformed bonds. Being 100% bonds would have been a disaster for your portfolio. As Warren Buffet says, whatever notional gains he misses, he considers them a loss. Another point (AlohaJoe hinted at it). If one's portfolio grows by 20% in a few months, then drops 50%, does it REALLY feel like a 50% drop? Or less than that? Yes, we're all subject to anchoring bias, but to which extent? If the portfolio grew 20% at some point, then stayed stable for a couple of years, then yeah, a sudden drop of 50% would feel like it (the anchor is set). But it would definitely not feel like that in the first scenario (steep rise, steep drop). Which is basically what happened in 1929 or 2002 or 2008 (while the 1973 crisis was markedly different). I have long thought that drawdown charts should depict the drop from the lowest point reached in the past year, or something like that. But even that isn't quite right. Human emotions are just so hard to quantify! The author really drives home that most of those crises are fully due to human foolishness, which does NOT change much over the centuries. And then, maybe, we can become a little more detached from those 'worst crises/disasters', and focus on what matters much more in life, decent income and enjoying life while we can. 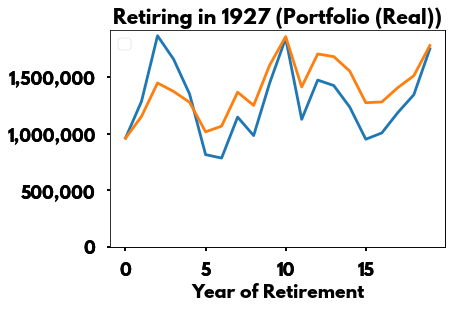 While I think the results are interesting to see what happens to a portfolio during these major downturns I disagree with the posters that somehow by looking at the charts you can conclude what your asset allocation should be. Most people are investing for decades and decades and even in retirement you may have 30+ years. These charts only look at the negative years and ignore the great increases before and after which would have been missed by an overly conservative portfolio. Yes, his avoidance of corporate bonds would be right up Larry Swedroe's alley. And frankly, it makes sense to me. Corporate bonds behave like a mix of mostly Treasuries and some stock. Short-term Treasuries and T-bills looked better than about anything else I've seen, but positive real returns were pretty scarce in that period. If one's portfolio grows by 20% in a few months, then drops 50%, does it REALLY feel like a 50% drop? Or less than that? When we're in a stock bull market such as we currently are, some investors loose site of the consequences of a bear market on a stock heavy, indexed portfolio that by its very nature takes no steps to mitigate losses during bear markets. Last edited by InvMoney on Sat Jul 07, 2018 10:59 am, edited 1 time in total. I look at these in a different way. These are not the worst case portfolio disasters. The real beasts are the single stock risk calamities (or single country in case of the Axis and Soviet Bloc). Those guys made even the 100% stock portfolios look great in comparison. Does anyone know how much of the inflation was "unexpected" and therefore would have been protected by TIPS, had such securities been available? What is pretty clear though is that TIPS did become available as a direct reaction to the inflation/bond crisis of the late 70s and 80s. So I’d say the market clearly didn’t expect that inflation. 1+ Excellent point, siamond. Great discussion also. Graphs, like statistics, if tortured sufficiently will confess to the desired conclusion. Few things are as certain as advertised where investing is involved. Whether bonds are safer than stocks varies during a given time frame. Sometimes they are safer (1929 - 1941): sometimes they are riskier (1941 - 1982). Even things we all assume to be true like stocks reliably outperforming bonds over long time periods is open to question depending on the time period chosen. In the former 12 year period (1929 - 1941) they did not; in the later 40 year period (1941 - 1982) they did. This makes a strong case for a balanced portfolio unless you have massive wealth/totally secure income stream in which case you can do anything you wish and remain financially secure. Historically there are long time periods in which either bonds or stocks, or in the case of stagflation both, suffer many consecutive years of low/absent/negative real returns. Predicting these periods in advance is unreliable. Having both in a portfolio in general smooths out the ride and may or may produce better returns over a given time period. In general there is a risk/reward tradeoff. In general stocks outperform bonds over the long run although how long that period is may be difficult to define. Current parameters do have some (about 40%) predictive value about future returns but, although better than nothing, that is less than a coin flip. Investing is a tricky business with a high level of uncertainty. If you accept that up front and prepare yourself for shocks you are ahead of the game IMO. The journey for those with 100% stocks can be emotionally hazardous, but so can it be for those with 100% bonds for risk aversion. If you do so during the wrong time period, you can lose big time. The most important decision for investors to make is not which specific equity or bond funds/ETFS to use although this is what most of us obsess over. rather the critical decision is the relative stock/bond portfolio allocation in accord with the individual's specific risk tolerance, financial goals and personal circumstances. Any low cost, broadly based, well-diversified, balanced portfolio--factor, cap-weighted index, or active--will get the job done if not abandoned during the inevitable downturns along the way. Graphs, like statistics, if tortured sufficiently will confess to the desired conclusion. Few things are as certain as advertised where investing is involved. Whether bonds are safer than stocks varies during a given time frame. Sometimes they are safer (1929 - 1941): sometimes they are riskier (1941 - 1982). I find it hard to accept this notion that investors today should be weighing "bond crises" equally with "stock crises." Certainly, there have been long periods in the past (the 1940s, the 1970s) when high inflation seriously eroded the real value of bond-heavy portfolios. But this is why TIPS were created. Thankfully, we no longer live in a time when nominal bonds are our only choice — which makes past "bond crises" mostly an artifact of history in my view (and a bit oxymoronic today, if I may add). In short, yes, bond-heavy portfolios were risky in the past — but stocks today are still as risky as they have ever been! Agree that investors should pay more attention to stock crises than bond crises. I'm probably one of the more vocal supporters of Tips. But i would not go as far as to say that TIPS have made "bond crises" a thing of the past or an artifact of history. The risk of tips is that real interest rates will spike. That could happen for any number of reasons. US could default or be downgraded. That's why liability matching is so important. If you can hold US government bonds to maturity you will likely be fine (barring default). Simplegift.....Really like the history charts. A lot. Here is what struck me. 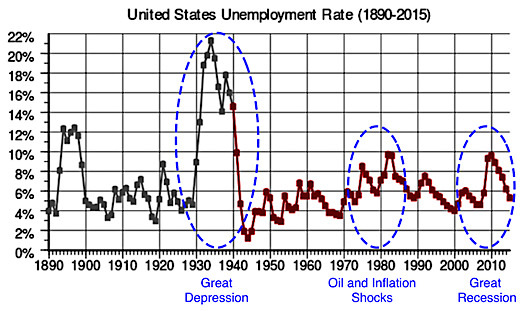 What are the commonalities between the Great Depression and the 1970's Stagflation Era? And can we identify them? It seems that going heavy on bonds wound up doing much better. One poster mentioned something about huge run-ups in equities which is true of the Great Depression (Roaring Twenties, anyone? 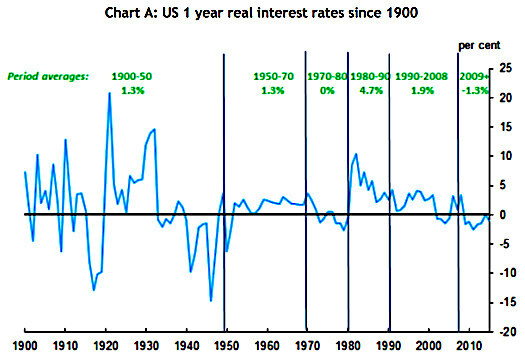 ), but not the Stagflation Era. To me, find the commonalities between the the two periods, and then we may have something very actionable indeed. What was monetary policy like before each period? Commodities? World trade climate? Asset backing of currencies? I guess we took away very different messages from Roth's book. When I read it, I came away with the understanding that Roth was completely convinced that the stock market would absolutely recover -- and in a relatively short period of time. He had no doubts on the matter at all. Nearly every page is him writing about how he wishes he had some money so he could buy stocks because he was so positive they would make a man rich in the next 2-3 years. For those who haven't read the book, June 1931 was when he started his diary, so we don't have much real information on the period from September 1929 to June 1931. All he really has to say about stocks during that period is "Immediately after the 1929 crash the speculators rushed in to buy 'bargains' but were badly mistaken because the market kept going down [...] At present time [ed: 1931] the newspapers are urging people to buy these 'bargains' but opinion is much divided as to whether or not the bottom has been reached." Roth rarely talks about other people's opinions and when he does he uses extremely broad terms that make it hard to draw any real conclusions from. But Roth himself was convinced from the very beginning that everything would recover. Partly that was his innate American optimism and partly it was based on his readings about previous depressions which, though they sometimes took 5 years to resolve, always did resolve and return to booms. While the economy isn't the same as the stock market (the stock market began recovering in the summer of 1932 but the economy didn't improve until 1933), when I read his diary I was struck by how his "at the time feelings" of turning a corner (and his reports of newspaper reports to the same effect) lined up pretty well with the market beginning its recovery. As you suggest, the best way to achieve maximum safety with bonds today is holding individual TIPS to maturity. Yep, I got exactly the same perception when reading the book, which surprised me. In all fairness, he still had a job though, even if he was struggling at times. It is much easier to see a stock crisis as an opportunity when you have reasonably stable income. Another thing that struck me was Roth's tracking of prices for basic goods. Geez, did this go up and down. Anybody telling you that they can ride inflation/deflation by just doing some level of product substitution really should read this book... Purchasing power is a real, inflation-adjusted, quantity, period. Thanks for the post. 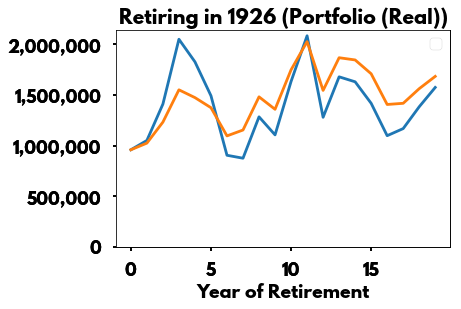 Those charts seem to suggest to me that having a 'side' portfolio with an extra year or two of expenses at the point of retirement might help retirees to avoid having to withdraw from a distressed portfolio in the worst ravages of a downturn. 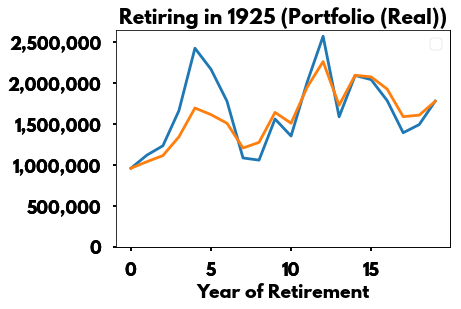 ERN recently studied this and found it to be surprisingly effective for the worst retirement starting years in the U.S., 1929 and 1966.